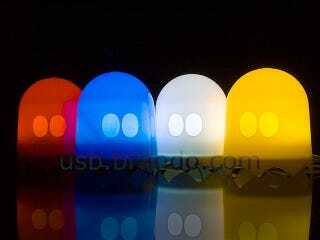 These USB ghosts are retro-tastically cute, illuminating and completely unlicensed, which is probably why I have the sneaking suspicion lawyers, somewhere, have already fired up whatever software they use to create legal docs. But enough about that! Here's an additional feature that's pretty cool to consider as their time slowly begins to run out: They're light-sensitive! So, when the lights go low, these guys light up, bringing color to your otherwise dark and dismal room full of other knockoff paraphernalia.